Utah is probably one of the most unique and beautiful states in America. With approximately 23 million acres of public land, mapping of these lands is critical. Realizing this need, BackCountry Navigator thought about adding BLM maps for Utah as an add-on purchase to BackCountry Navigator PRO. Utah is the sixth most urbanized population in the U.S. 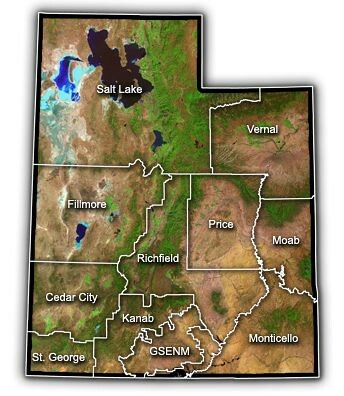 Approximately 80% of Utah's people live in Salt Lake City, the center of the Wasatch Front. Salt Lake City is a land of illusion of floating islands and vanishing water mirages. Almost touching the Utah-Nevada borders is the Bonneville Salt Flats, a unique plain of almost pure, white salt. This geological oddity is one of the only places in the United States where one can see the curvature of the earth over dry land. Just south of the Salt Flats lies the Pony Express Trail where horse riders risked their lives delivering the mail in 1860 and 1861. Many historic and prehistoric interpretative sites are open to visitors. BLM Utah strives to protect and preserve the present condition of cultural resources on public lands for the benefit of present and future generations. Utah BLM maps help in regulating the proper use of public lands while protecting the visitors from wandering to private properties. In June 2000, the BLM created the National Landscape Conservation System or NLCS to bring the BLM's primary designations into a more organized system. The NLCS contains some of the West’s most spectacular landscapes. It includes over 886 federally recognized areas and approximately 27 million acres of National Monuments, National Conservation Areas, Wilderness Areas, Wilderness Study Areas, Wild and Scenic Rivers, National Scenic and Historic Trails, and Conservation Lands of the California Desert. Utah is so vast, so enchanting that people who plans to visit the place must have a list of what to do there. First on the list must be an Android GPS travel app in your Android phone with Utah's BLM maps. BackCountry Navigator PRO has available add-on maps for Utah, which can be purchased here. Confidence that they will not be violating private properties in their planned commune with one of the unspoiled natural places in the US will definitely result in a fulfilling trip.